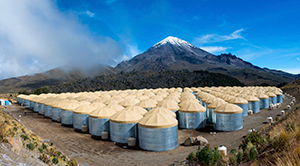 Michigan Tech team and others use a high-altitude observatory in Mexico to better understand where gamma rays come from. In 2008, a space-borne detector measured an unexpectedly high number of positrons—the anti-matter cousins of electrons—in orbit. Ever since, scientists have debated the cause of the anomaly, split over two competing theories of its origin. Some suggested a simple explanation: The extra particles might be coming from nearby collapsed stars called pulsars, which spin around several times a second and throw off electrons, positrons and other matter with violent force. Others speculated that the extra positrons have an exotic origin, perhaps coming from as-yet undetected processes involving dark matter—the invisible but pervasive substance seen so far only through its gravitational pull. Using this new data from the HAWC observatory, researchers made the first detailed measurements of two pulsars previously identified as possible sources of the excess. By catching and counting particles of light streaming from these nearby stellar engines, the HAWC collaboration showed that the two pulsars are unlikely to be the origin of the positron excess. Despite being the right age and the right distance from Earth, the pulsars are surrounded by an extended murky cloud from which positrons can’t escape in great numbers, according to results published this week in Science (DOI: 10.1126/science.aan4880). 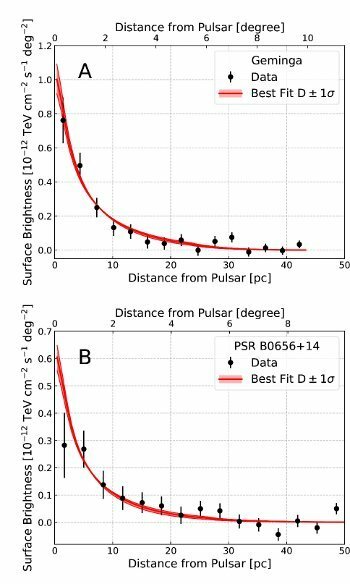 “Our analysis does not support previous claims that the two nearby pulsars are responsible for the excess of positrons detected by two space-born telescopes, the Italian-lead PAMELA project and the AMS-02 detector of NASA,” she says. The HAWC Observatory sits at an elevation of 13,500 feet, flanking the Sierra Negra volcano inside Pico de Orizaba National Park in the Mexican state of Puebla. More than 300 massive water tanks sit waiting at the site for cascades of particles initiated by high-energy packets of light called gamma rays—many of which have more than a million times the energy of a dental X-ray. This measurement wouldn’t have been possible without HAWC’s wide view. It continuously scans about one-third of the sky overhead, which provided researchers with a broad view of the space around the pulsars. 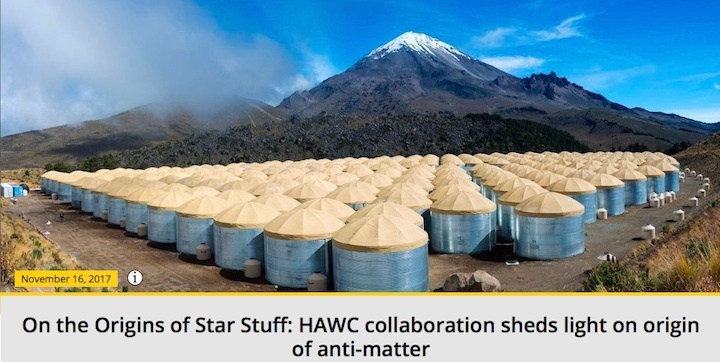 “Thanks to its wide field of view, HAWC provides unique measurements on the very-high-energy gamma-ray profiles caused by the particle diffusion around nearby pulsars, which allows us to determine how fast the particles diffuse more directly than previous measurements,” says Hao Zhou, now a scientist at the Los Alamos National Laboratory in New Mexico and Michigan Tech alumnus. Zhou, one of the paper’s corresponding authors, is responsible for developing the particle diffusion model and calculating the gamma-ray emission morphology around the two pulsars in HAWC data. He fit this model to the data to constrain the physical parameter about these sources, which describes how fast a particle diffuses away from its source. As with an ordinary camera, collecting lots of light allows HAWC to build sharp images of individual gamma-ray sources. The highest energy gamma rays originate in the graveyards of big stars, such as the spinning pulsar remnants of supernovae. But that light doesn’t come from the stars themselves. Instead, it's created when the spinning pulsar accelerates particles to extremely high energies, causing them to smash into lower-energy photons left over from the early universe. The size of this stellar debris field, measured by the patch of sky that glows bright in gamma rays, tells researchers how quickly matter moves relative to a local astrophysical engine—in this case, the nearby pulsars. This, in turn, enables researchers to estimate how quickly positrons are moving and how many positrons could have reached Earth from a given source. 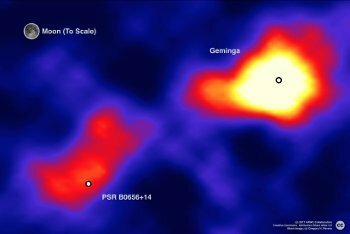 Using the most complete catalog of HAWC data to date, scientists have determined that the nearby pulsar Geminga and its unnamed sister are not sources of the positron excess. Even though the two pulsars are old enough and close enough to account for the excess, matter isn’t drifting away from the pulsars fast enough to have reached the Earth. Chris Cesare at University of Maryland co-authored to this article.